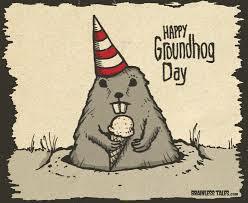 Ed Valentine | Happy Groundhog Day – AGAIN! No, I haven’t gone mental. Neither have you: I really did post a Happy Groundhog’s Day Message a week ago. This entry was posted in Uncategorized. Share link: http://www.edvalentine.com/happy-groundhog-day-again/. Follow comments with the RSS feed. Post a comment or leave a trackback: Trackback URL.